LaserICO.online is essentially a continuation, or rather the second coming, of a well known and well documented scam: Laser Online. Promising returns of 12% per day, Laser Online was the quintessential Ponzi scheme, which we reviewed too. The reason we’re talking about it in past tense is that in its initial form, the Laser Online scam no longer exists. It has metamorphosed into Laserico.online, a site pushing an altcoin (LZR), which no longer maintains any sort of ties to the original scam. The funny thing about the this whole “evolutionary” run is that those in the know had predicted the exact way it eventually unfolded. As they say: nothing is original in Ponzi land, and this scheme was indeed born and bred there. So, how exactly did we get to this stage with these Laser people? In its original form, the scam could obviously not last. When it started to withhold payments, many already knew it was in its death throes. Getting rid of the ROI responsibility became the top objective of its pushers and to accomplish that, they converted the unpaid affiliate balances to LZR points, which were obviously worthless. 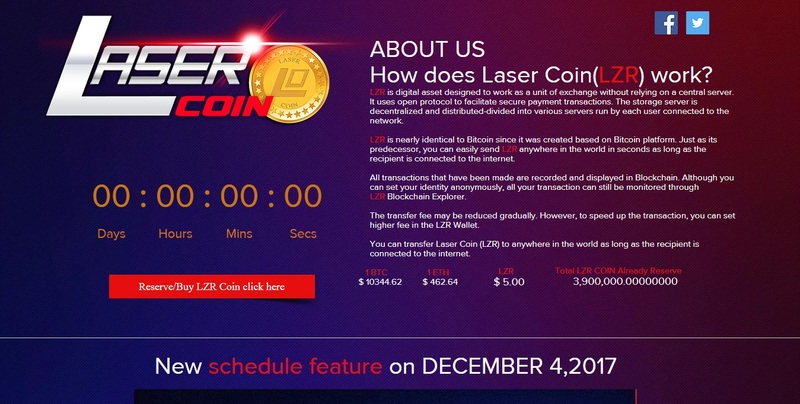 The conversion rate was – according to Laserico.online – $5 for every LZR point. The following step was to hire a developer and to push out an altcoin, thus completely eliminating all ROI responsibility. LZR is supposedly a “real project” which generates real revenue for its team and investors. To attempt to pump the altcoin, Laserico.online has ripped a page right out of Bitconnect’s book: it runs a lending scheme, with no fiat tether, and with commissions supposedly distributed in BTC. According to the blueprint/schedule made available at the Laserico.online site, this whole LZR initiative looks exactly like Bitconnect. It is sort of obvious that the Laser Online people are hoping it might replicate some of BCCs success. With the above in mind, you obviously should not. Pushing out an altcoin to completely bury a Ponzi scheme has unfortunately become standard MO for the pushers of such shady operations. As made clear above, the whole operation is indeed a giant red flag. It is nothing but the natural evolution (or rather: devolution) of a classic Ponzi scam. While on the surface, Laserico.online has no links to the now defunct Laser Online, it is indeed nothing more than the same people setting up their exit from the scene…stage left. Referral commissions are also back, in classic Ponzi-fashion. Those still pushing this double train wreck of a deal, can “earn” 4% on their Level 1 referrals, 3% from Level 2, and 1% from subsequent levels. Needless to say, the identity of the website registrant is under wraps. Given that the whole LZR deal was only launched a couple of days ago, there aren’t any user complaints available about Laserico.online yet. Laser Online is a different matter though, and all you need to do to take the pulse of the community on it, is to head over to our Laser Online review and scroll down to the comments section. As of December 6, 2017, LaserICO.online was ranked globally 1,239,074 by Alexa.com. Most visitors to the site reside within the United Kingdom, Vietnam, United States, Saudi Arabia and India. Laserico.online is a scam. Unfortunately, it is one of those scams that tear away at the overall reputation of the cryto industry. Looking to replicate the “success” of Bitconnect, the operation will inevitably leave people high and dry, once its LZR coin hits its true value, which is $0.00. At this point, it is safe to say that the longevity of Bitconnect is nothing more than a pipe dream for this shoddy outfit. Review Verdict: LaserICO is a SCAM! Have you fallen victim to LaserICO? Please share any feedback you may have by leaving a comment below! Expand your horizons by learning about legitimate cryptocurrency investment opportunities through our Cryptocurrency Investment Guide! For those of you searching for a way ahead of the crypto curve, we encourage you to subscribe to ScamBitcoin.com. Members receive reviews and scam warnings directly to their inbox free of charge! THEY SCAMMED ME. I have been requesting to be paid for over a month, nothing ever happens, just a lot of excuses. Thank God I did not invest thousands of dollars. Such a shame!! Hello admin ..can u check btcdreams mining and illivion mining..its is can be trusted or not? We will check MyBTCDreams for you. Couldn’t find illivion though. What’s their website’s address?